Recently co-chairs of Free Life Party of Kurdistan (PJAK) discussed the fifth congress of their party on NewrozTV program and announced future plans. 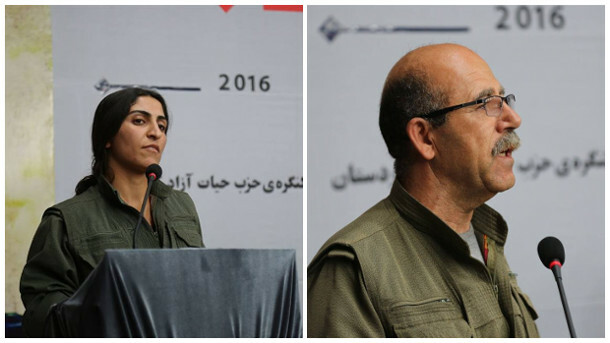 Co-chair of PJAK Zîlan Vejîn indicated as a member of KODAR, PJAK endeavors to build a democratic nation along with other parties of Iran and Rojhelat (Eastern Kurdistan) and she added: “As a pioneer in KODAR, PJAK is attempting to familiarize its democratic solution to people of Kurdistan and Iran. It would be extremely beneficial to people, political parties and other organizations if everyone unite their struggle, especially at this time that Iran is facing many crises. Not only PJAK has plans and projects for deal with the crises but also it has the humanpower to discuss and make progress in Kurdish question.